This classic version of the Triskele, or Triple Goddess design has nice thickness and feel, in a small yet solid diameter offering at 1/2" with a robust fixed bail. This name is descriptive of the meaning of this most ancient symbols. 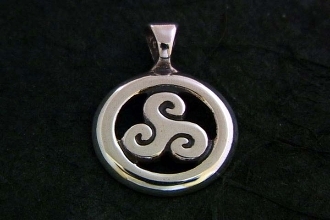 This design goes by many names: Triskele, Trefoil, Trillium, with various spellings and prenunciations. Though there are many concepts in ancient Celtic lore in relation to sets of three, one of the most powerful images, is the 3 phases of womanhood. The three phases which constitute the source of life are: Maidenhood, Motherhood, and Wise Woman. Much Honor was given to women in matriarchal celtic culture as well as pre-Druidic Neolithic tribal systems as well. The virtuous Maiden, the nurturing Mother, and the wise Woman who has seen all 3 phases of womenhood as the giver of life. This item goes well with a 1mm or 1.5mm Round Box Chain, or a fine box chain.